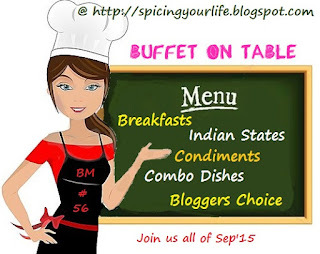 Today in the final leg of the month of #Blogging Marathon called #Buffet on Table we are doing bloggers choice. To tell you the truth I was more worried about what I will be writing about here. Blogging about food is now second nature but about my interests, other interests! I will like to share my new interest these days. Trekking! This Sunday the 6th Sept 2015, we went on trek no 85 to Chorla. I will not add anything of my own here. These are Parab’s, the man behind organising these treks, introduction to this trek will be enough for it says all his passion for trekking or hiking. In fact we will have extra bonus of having Prof. Rajendra Kerkar amongst us for this trek. He has suggested this beautiful destination, where you will have walk in jungle, in plains, in mud filled routes,,etc..etc…! Added attraction is the waterfall ( safe ) inside the jungle where you can cool your heels. let me tell you when we trek with Eco Treks we have certain rules, we avoid littering, no more do we use paper plates we carry our own plates and water to clean and reuse them, our little contribution to the growing garbage pile in this world. in fact there are times when we collect all the garbage lying around at the destination and dispose that at our homes. We totally oppose and do not allow any kind of littering or any other activity that can harm the environment. Also the consumption of alcohol, drugs, smoking or chewing tobacco in any form is not allowed. Have a look at some of our pictures. Some you have already seen on social media… enjoy like I did on this trip. beautiful clicks and very well written post.. Sounds like an excellent place for trekking.. Beautifully written Archana, wish i visit this place a day. That sounds like a fun trek. It looks so serene & pristine. Ah I had enjoyed these pictures when you had shared some with us..nice reading about your experience.. The place looks beautiful, I like the idea of trekking..relieves all stress…specially when you have such mixed crowd..so much fun too…you should have put captions on the local food..looks great. Opens your mind, heart and lungs!! Loved it arch!! Loved your economic point of view of using your own plates n mugs. Beautiful place, lovely clicks and so very well written. Fun trekking and beautiful post. Lovely pics and amazing pics Archana. I enjoying trekking, love greenery, you too must enjoyed this trek. Very beautiful clicks.Love reading your post. Thanks fro the virtual tour. Thanks for the virtual tour. You must have had a blast amidst friends.